Monica Paige DePaul was born in Staten Island, New York in 1987, to her parents, Patricia and Chris DePaul, and older brother, Mark DePaul. At the age of 5, she and her family moved to Palm Coast, FL, where she attended public school. At 18, Monica moved to Jacksonville, FL, where she attended the University of North Florida (UNF) with a full academic scholarship. She double majored in English and philosophy, mastering the art of breaking down opposing arguments and interpreting language. After graduating in 2009, she stayed in Jacksonville to achieve her master’s degree in English at UNF in 2011. All the while, she worked as a tutor to help other students master their writing skills and succeed in college. In 2012, much changed in Monica’s life. 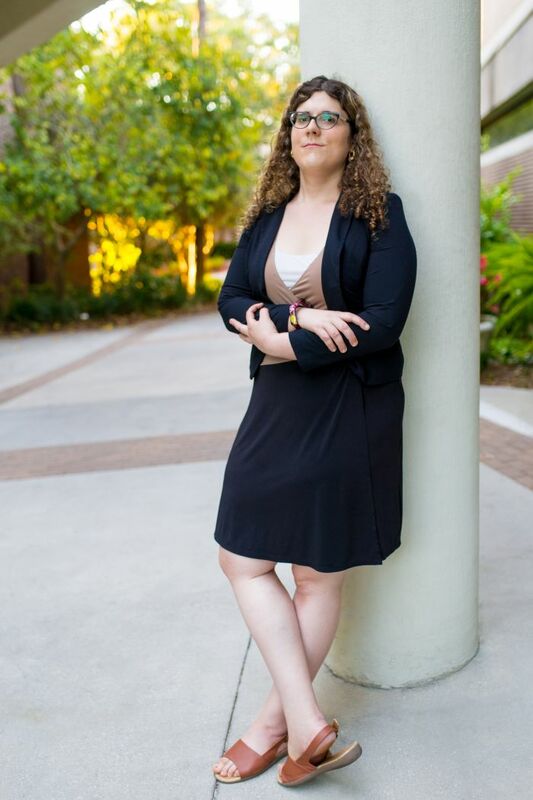 She began her job as an adjunct professor at UNF, teaching freshmen-level writing courses. She cared little about online reviews of her and focused instead teaching valuable skills in a challenging environment. Therefore, her classes were not easy A’s. Monica provided students of a variety of majors with the skills they needed to succeed with real-life professional writing settings. She also taught the critical thinking and reading skills necessary for students to live independent lives and resist rhetorical manipulation from others. Unfortunately, Monica lost this position in 2017 because of discrimination from her now-former program coordinator against her research interests in political rhetoric, gender studies, satire, and interactive media. Since her forced departure violated UNF policies, the university agreed to a legal settlement. Later in 2012, Monica completed her first book, Blood on Fire, a satirical and action-packed take on the vampire genre that also pokes fun everyday issues real people face. It’s the darkly comedic tale of Amy Able, a teenage girl who never asked to become a vampire but still must clean up the mess caused by a deep-reaching conspiracy headed by aristocratic undead. Monica released a direct sequel, Blood on the Rocks, in 2016, which presents a political allegory as a high school drama. Lastly in 2012, Monica began the process of becoming her true self as she took on the long, arduous, and expensive journey of transitioning from male to female. This learning experience truly taught her who she was and what it meant to be both a woman and human. Navigating America’s healthcare system as an adjunct professor with no benefits was no easy task. This experience has given Monica the insight to know that Medicare-for-all is the only viable solution to fix America’s healthcare crisis. To this day, Monica is a powerful voice in the LGBT community of Northeast Florida. She helped push for Jacksonville’s LGBT-inclusive Human Rights Ordinance. Her intense speaking and writing skills moved the Jacksonville City Council closer to making the right decision of protecting equal rights for everyone. Every day, Monica is a living contradiction to the made-up bathroom boogeyman the right-wing uses as a political scapegoat. Her voice counteracted the lying and fearmongering of the opposition. In 2016, Monica made history. After volunteering for Bernie Sanders campaign during the Democratic primary, Monica was elected as a pledged delegate for Senator Bernie Sanders. She attended the Democratic National Convention on behalf of Florida’s 4th Congressional District. This made her the first transgender delegate from Florida and a member of the largest transgender delegation to attend any national convention for a major political party. She also proudly participated in the Florida delegation’s historic protest of former DNC chair Debbie Wasserman-Schultz and her corrupt domineering of the Democratic party. As of 2017, Monica works as a substitute teacher for Duval County's public high schools. Monica has rapidly gained influence in Florida politics thanks to her no-nonsense attitude and her drive to accomplish good. She had the skills to predict the results of the 2016 election. She knows that spreading a narrative of inevitability, like how Hillary Clinton was portrayed, can easily backfire. When progressive ideals that many registered Democrats, Republicans, and independents support are ignored, voters stay home. Now she’s here to fight the dominance of corporate rule by rich oligarchs like Donald Trump. Monica will not tolerate the racism, sexism, homophobia, and lying that have become the political norm.